This "Oklahoma!" is definitely O.K.! Makes me want to dance on top of a hay stack. My grandparents once took me to see this musical in central Oklahoma at an outdoor production. I was a fan from that moment on. The music here accentuates the greatness that is the American musical in ways that will make you feel happier for having listened to it. I dare you to listen to the main theme of this song and still feel down about your day. Chances are you will start singing along when you've heard it a few times, or, if you're like me, throw your arms up in the air as your driving around town as you sing the lines, "OoooooooKLAhoma where the wind comes swinging down the plain!" 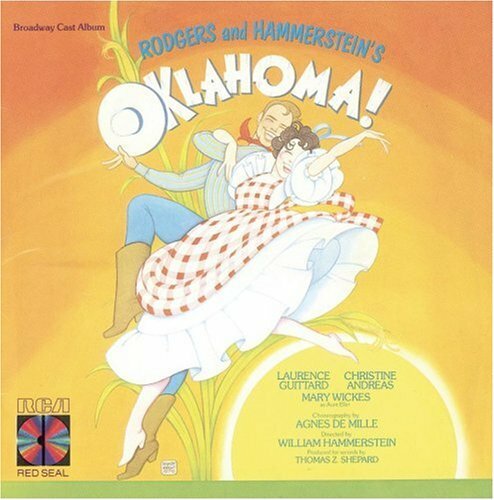 This cast album to the acclaimed 1979 Broadway revival of OKLAHOMA! is a perfect testament to its amazing cast and the everlasting legacy to the genius of Rodgers and Hammerstein. Laurence Guittard (A LITTLE NIGHT MUSIC) and Christine Andreas (MY FAIR LADY, ON YOUR TOES) headlined the revival as the starcrossed lovers Curly and Laurey, respectively, with the delightful Mary Wickes in her element as Aunt Eller. Making their Broadway debuts as the secondary couple Ado Annie Carnes and Will Parker were, respectively, Christine Ebersole (42ND STREET) and Harry Groener (CRAZY FOR YOU). Martin Vidnovic (THE KING AND I) played the menacing farmhand Jud. Laurence Guittard has a warm and resonant voice, which is well-suited to the role of easygoing Curly, and he sings a gorgeous version of "Oh, What a Beautiful Mornin'". Dulcet-toned Christine Andreas is a perfect Laurey, singing a thrilling and yes, dreamy, version of "Out of My Dreams", whilst her rendition of "Many a New Day" turns into a jaunty anthem of defiance. Utterly delightful. Christine Ebersole, who won a Tony for the 2001 revival of 42ND STREET, is a perfect fit for the comical soubrette role of Ado Annie Carnes. Her "I Cain't Say No" drips with humour, while her duet with Harry Groener in "All 'Er Nuthin'" is perfectly-performed. Nearly complete but flawed Broadway revival recording. 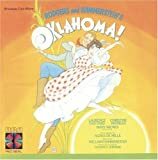 Not Complete, but the Best Recording of Oklahoma! This is a terrific recording of the Rodgers and Hammerstein classic. Christine Andreas is a FANTASTIC Laurey, bringing real independent spirit and a vivacious energy to "Many a New Day", while soaring with a her lovely soprano over her big ballads, "Out of My Dreams", and "People Will Say We're in Love", a duet with Laurence Guittard, who sings all of his songs with warmth, heart, and beautiful voice. Harry Groener is the ideal Will Parker, and Christine Ebersole is the best Ado Annie on record, bringing tons of humor and a healthy, strong belt to "I Cain't Say No". Martin Vidnovic's Jud is in very good voice, and although her doesn't bring the emotional turmoil to "Lonely Room" that Shuler Hensley does on the 1998 London Recording, he comes in a very close second. The rest of the cast is in fine shape, the orchestra plays at ideal tempos, the sound is crystal clear, and the orchestrations are vibrant and fantastic.